We’d love your help. Let us know what’s wrong with this preview of About Last Summer by Patricia B. Tighe. There’s just one major surpr Pretend to be from Spain? Act like she can barely speak English? Sure, why not? It wouldn’t be the first time Gabby Vega had agreed to a challenge from her best friend, Kenzie. Besides, it’s only for a week of vacation with Kenzie’s cousins. Gabby will prove to Kenzie she can keep up the fake identity for the whole trip—that she’s not a quitter. To ask other readers questions about About Last Summer, please sign up. This book is ADORABLE! When I got to the Sardine Game part...swoon. For a clean YA romance, I definitely felt their feels. Oh my goodness, it was perfect. And that's all I'll say because you'll just have to read the book. This is a fun, summer read, that makes you love summer vacations. So, go read this book. 4.5 stars! I read this adorable summer contemporary in one sitting! Cute story with engaging writing! If you like the story of Persuasion by Jane Austen, it gave me a similar story vibe! Check it out! I think I said this before, and Imma say that again: Patricia's writing style is awesome and every story she writes is even cuter than the previous one. How she does that is still a mystery to me. 5 stars to this incredible contemporary YA because yes. Yes, I love good love stories. This one has great characters, both the two main characters AND the "side" (they're everything but side) characters. Kenzie, Molly and Geoff are great examples, each and everyone of them different in their own unique w I think I said this before, and Imma say that again: Patricia's writing style is awesome and every story she writes is even cuter than the previous one. How she does that is still a mystery to me. This one has great characters, both the two main characters AND the "side" (they're everything but side) characters. Kenzie, Molly and Geoff are great examples, each and everyone of them different in their own unique way. This novel is also this good because of the little details that the writer puts in the story, like, I really loved the scavenger hunt part, and the play, and being able to see how different Gabriela/Gabby are, is amazing. One more thing: the double point of view should be mandatory in all contemporary novels. When Gabby Vega’s best friend, Kenzie, accuses her of failing to follow through on anything and challenges her to work on her acting by pretending to be from Spain for one week, Gabby decides to prove she’s not a quitter. After all, it’s only one week of vacation with Kenzie’s cousins. But, that was before she knew that Noah Jernigan would be joining. Noah, the boy from drama camp last summer who she had to dump when summer was over. Now he’s the only other person who knows who she really is and seems to be taking revenge for his broken heart by seeing how uncomfortable he can make Gabby’s week-long challenge. Overall, Patricia B. Tighe’s latest novel has all the hallmarks of a good summer beach read, an easy, relaxing read with a happy, satisfying ending. My one complaint would be that both Gabby’s and Noah’s character felt a little flat. I was confused as to why Gabby was actually putting up with some of Noah’s sometimes cruel antics and why they were okay with the whole charade. However, the secondary characters were engaging and made up for the flaws in Gabby and Noah and the story kept me interested until the end. Cute romance with an HEA that put a smile on my face. If you're looking for a sweet escape, this is the right story for you. The premise is unique, and the feelings realistic - it brought back memories of my own high school awkwardness and anxiety, which seem so far away now, but are growing pains many readers can relate to. The humor takes the edge off the drama, leaving a feel-good story that entertains. At first, I didn't like Noah and Gabby. Noah came off as vindictive, and Gabby seemed scared of her own shadow. However, as their characters' grew, so did my enjoyment of their story. My hands-down favorite scene in the whole book was the play at the end, which had moments where I literally laughed out loud. It was a cute read, and I will check out more of Ms. Tighe's stories. 4.5 Stars! Well that was PRETTY DARN CUTE!!! About Last Summer is a super fun read that will have you swooning and giggling. At least I did… and now I’m smiling like a dork after that perfect/adorable ending. *I received an E-ARC of this book from the author in exchange for an honest review. Before I go into my review, let me just say that I have a weakness for cutesy, fun, and fluffy YA contemporary romance. There is just something about them that always makes me fee 4.5 Stars! Well that was PRETTY DARN CUTE!!! 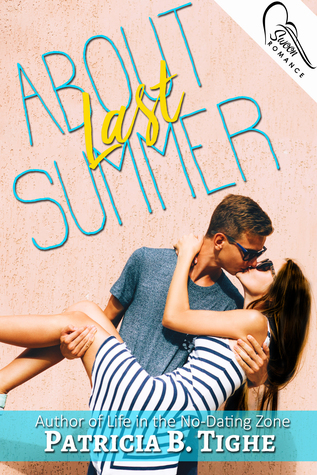 About Last Summer is a super fun read that will have you swooning and giggling. At least I did… and now I’m smiling like a dork after that perfect/adorable ending. Before I go into my review, let me just say that I have a weakness for cutesy, fun, and fluffy YA contemporary romance. There is just something about them that always makes me feel all warm and fuzzy and leaves me with this wonderful dreamy high… and this book most certainly does not disappoint. But what I love most is you get a lot more than what you expect. It’s not just about the romance...It’s also a story about self-discovery and having the courage to face your insecurities. A story about first crushes, heart breaks and learning how to move forward. A story about honesty, forgiveness and taking chances. A story about the importance of family, friendship and spending time with those you love. Patricia does an amazing job weaving all that, a little quirkiness, a lot of humor and so much more into this story. I already miss the whole gang. This review has been hidden because it contains spoilers. To view it, click here. I loved this book! It was such a cute YA romance. My favorite part was the exchange of Molly, Kenzie, and Gabby when Molly gives them advice based on her relationship. It was so down to earth and heartfelt. I loved the concept of the play that the cousins and friends performed. At times, I just wanted to shake Gabby and Noah and make them sit down and work it out, but I feel like their reasons for not talking things out in the story until they finally face each other are realistic and not contri I loved this book! It was such a cute YA romance. My favorite part was the exchange of Molly, Kenzie, and Gabby when Molly gives them advice based on her relationship. It was so down to earth and heartfelt. I loved the concept of the play that the cousins and friends performed. At times, I just wanted to shake Gabby and Noah and make them sit down and work it out, but I feel like their reasons for not talking things out in the story until they finally face each other are realistic and not contrived. I would love to read more about them. I was given a free ebook by the author for a honest arc review. If I wasn't reading for the sole purpose of review, I would have put the book down before reaching 100 pages. I was put off by how the best friend Kenzie put Gabby down and Gabby didn't react. I wasn't given any reason why the two were friends. As it flips between POV of Gabby and Noah, there was no significant change in voice. I had to flip back a page a few times to remember who I was reading as they were so similar. The story ran e I was given a free ebook by the author for a honest arc review. If I wasn't reading for the sole purpose of review, I would have put the book down before reaching 100 pages. The story ran extremely flat. There were no parts to make me gasp or want to keep turning the page. The characters have no idea what to do next, and seem to hate what ever they are doing. I loved the premises of the book: a girl in holidays in her own country pretending to be foreign. However, I found it wasn't highlighted enough throughout the story. It actually seemed forgotten about. Majority of the time it felt like I was reading someone's first draft that needed revision, so the story could have better structure. I found some of the descriptions confusing. In some scenes it was hard to tell who was where and how they were moving their body. The award-winning YA romance author of THE ZONE series and the SECOND CHANCES series, Patricia B. Tighe lives in West Texas with her husband and dogs. She’s a sucker for romance and loves to put her characters in sticky situations to see what happens. When she’s not writing, she eats way too much pizza, drinks way too much coffee, and watches way too much NFL football.